A surrealist Sixties revival: Bonzos review from the Evening Standard. Photos from the Bonzos' sound check by Danny Barbour. Station street names, originally uploaded by fred pipes. 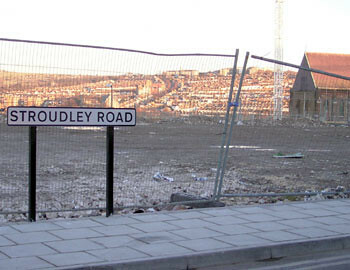 Noticed on Sunday after my Clarion bike ride that the new roads around the Brighton station site had been given names. I was delighted to see that the one nearest the station was named after William Stroudley, designer and locomotive superintendent of the London, Brighton and South Coast Railway known best for his 'Improved Engine Green' gamboge livery, as seen on Stepney at the Bluebell Railway. Billington I'm not sure of - it could be Lawson Billington, another LB&SCR Superintendent whose designs included E2 0-6-0T and K class 2-6-0 or more probably his father Robert John Billinton, Stroudley's assistant. Fleet Street is a nice touch - there was once a Fleet Street just one up from Belmont Street, the continuation of New England Street that is no more. More pix on Flickr. bonzo, originally uploaded by fred pipes. It was 40 years ago today... well not quite, it was Saturday 1 October 1966 I last saw the Bonzo Dog Doo Dah Band live. So it was with huge excitement I travelled up to London to see the 'revisited' gig at the Astoria, despite having to go via Lewes cos of engineering works. Popped into the Pillars of Hercules pub on Greek Street, which despite being smokey was friendly enough and full of Bonzo folk from th'internet! Plus a lime'n'soda with ice and slice of lime (I'm still on the wagon) cost a mere 31p! After a brief queue, we were in the venue and I had my half bottle of Brighton Corporation tap water confiscated (see rant below) but luckily kept my camera. We'd bought seated tickets and I'd assumed seats would be upstairs and standing down... Oh no, not so simple! Upstairs were tables and chairs at right angles to the stage with standing behind and downstairs was rows of cheap chairs, rapidly filling up. Ah well, too late to change. The stage had more instruments on it than at a Rutles gig and a screen behind was showing a drawing of Bonzo Dog. We waited for the scheduled Rutles support, but no, we had the Bonzos instead, raring to go. Down on the right front Andy Roberts was tuning up, then we had the full array. 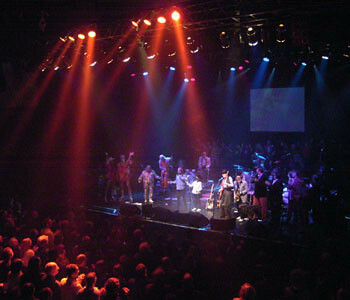 Back row, left to right was: Sam Spoons (Martin Ash) on percussion, Vernon Dudley Bohay-Nowell on saw and banjo, JJ Jones on drums, Tom Fry (in gorilla suit) on Bass. Front row: Roger Ruskin Spear on sax, Rodney Slater on clarinet and sax, Bob Kerr on trumpet, Neil Innes on keyboards (and later on guitar), Mickey Simmonds on keyboards and Andy Roberts on guitars and ukukele. Legs Larry Smith came on and off. The first half was mainly old novelty items (see set list) and ended with 'feel so gay' from 'Equestrian Statue' being reprised, appropriate since the Astoria tuns into a gay club at 10pm. Absent friends Viv Stanshall and Dennis Cowan were honoured with a minute's cacophony. Highlights included Bob Kerr's vocals for 'Little Sir Echo' with Sam Spoons on his knee dressed up as a vent's dummy. There were no robots, as such, but Roger did have some contraptions on stage, some of which worked! The trouser press and theramin leg had limited success. In the second half, we were treated to an electric set with celebrity guests, the first of which was Ade Edmondson (from The Young Ones) doing 'The Strain' very convincingly! He was accompanied by Phill Jupitus on guitar. This was followed by Stephen Fry, an obvious Viv Stanshall soundalike, narrating 'The Sound of Music' - he also tackled 'Sport' (obviously), the end bit of 'Trouser Press' and 'Rhinocratic Oaths'. Ade did 'My Pink Half of the Drain Pipe' with Roger, 'I'm Bored', 'Tent' (by request) and dressed up as a parrot for 'Mr Slater's Parrot', jumping off stage then wonderingwhere the steps that were there in rehearsal had gone! Paul Merton arrived near the end to do 'Monster Mash'. Phill also sang on 'Mr Apollo' and 'Canyons of your mind' worshipping at Neil's feet during the worst guitar solo ever recorded. Bill Bailey was supposed to appear, but didn't. The evening ended with Viv's voice on The Intro and the Outro, with everyone, including several dressed up anonymous kids, taking the various parts. Despite a long standing ovation there was no encore and the show ended at 21.45 with a tape of Slush (followed by Joy Division!). Rant: Gig venues seem to exist in a parallel universe where they are allowed to make up their own laws and have them enforced by jobsworth security staff with few powers of discretion. I strongly object to having my half old bottle of Brighton tapwater confiscated, because no food or drink is allowed to be brought in. I can understand that applying to a full bottle of Malibu and a hot pizza, but my friend Nick was nearly deprived of a bargain bag of apples he'd bought earlier for consumption back home. I also object to 'no photography' censorship, for photos taken without flash for non-commercial use. Museums and art galleries used to do this presumably to protect postcard sales (but the one thing you wanted a postcard of was rarely available), but these have largely been relaxed. It's time gigs saw sense and did as well. Fan photos (and audience recordings) will never hurt the pockets of professional photographers or record companies, but will rather fuel the demand for the promoters' and bands' products - they should be grateful. More photos on mine and Paul Webster's Flickr pages. NB Paul has now taken down his photos at the request of the promoter. The DVD will be out in October, BTW, more info from Classic Rock Productions (their own website doesn't seem to be working). Synchronicity! I read about, then visit Romney Marsh, then blow me, last Wednesday's 'Small Railway Journeys' (a Channel 4 gem with Jonathan Glancey) was all about the RH&DR. Then this morning, Simon Calder of the Indy visited Romney Marsh for The Heaven and Earth Show on BBC1. It's been a bit uneventful this past week - I've been on the wagon for a week now (as you do), keeping my head down, and trying to get back into the world of work. Not popping out for booze and food means I've been in a lot catching up with TV. No food, you say? With (almost) Perpetual soup, you need never go out again (at least for a week)! Perpetual soup (ideal for veggie batchelors) 1 onion 1 leek spices: cumin seeds, mustard seeds, fenugreek seeds some mushrooms cut in quarters 1 large potato 1 carrot several cloves of garlic 1 hot red pepper ginger (cut into matchsticks) some water a quantity of dried beans (butter, haricot, pinto, whatever) soaked and boiled a handful of pot barley veggie stock cube dash of Worcestershire sauce* a bay leaf a small pool of oil * contains fish (anchovies) Soak the beans overnight in water. Rinse and add cold water. Bring to the boil and boil hard for 20 minutes. Don't let them boil dry and burn like I usually do! To another large pan (or the same one washed out), add some oil, chopped onion and sliced leek and sweat over a low heat. Throw in some seeds, then the mushrooms, stirring all the time. Chop the potato into dice-sized chunks and add to the pan. Chop the garlic, ginger and pepper and throw into the pan. Wash your hands before you're tempted to rub your eyes! Boil up some water in the kettle and chop a carrot. Add the water and carrot and bring to the boil. Add pot barley, stock cube (the only thing in this that may be bad for you! ), bay leaf, dash of Lee & Perrins, and the boiled beans. Cover and simmer for as long as you can. This is best served with a slice of wholemeal or granary bread under, with ground black pepper on top. The following day, you can add a different chopped vegetable, such as sweet potato, squash, parsnip, artichoke, swede, and maybe some lentils or tomato puree, with a sprinkling of mixed herbs, and heat up thoroughly. After about a week, varying the ingredients each night - during which time it improves no end - add conchigliette or fried Quorn pieces. Finally, when you are yearning for a change, take off the heat and to the final dregs mix in some miso for a savory finale. Wait a day or two and start again. Variations: try fennel or celery instead of leek. nyd, originally uploaded by fred pipes. Happy New Year! 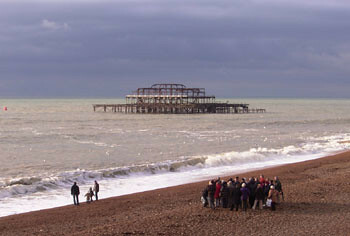 The obligatory New Year's day shot of the West Pier, Brighton. What on earth is that group of tourists doing? Huddling together to keep warm? RH & DR, originally uploaded by fred pipes. Inspired by Ian Marchant, I decided to go on a small railway journey to the Romney, Hythe and Dymchurch Railway. I had a free ticket to Rye, courtesy of Southern, who were celebrating the opening of a fast through route (by diesel) to Ashford, but as it didn't stop at London Road, had to get a train to Lewes and change there. Rye is a delightful little place, I discovered, and smaller than I imagined. I had half an hour to kill before my bus, so I headed west to the Heritage Centre, passing a pub called The Pipes (or, in full, The Pipemakers Arms). There's a collection of coin-operated machines upstairs at the Heritage Centre, but I didn't have time to change a pound coin into 7 old pennies (talk about inflation!) to get them working. Back downstairs I bought a signed copy of 'Captain Pugwash And The Huge Reward' by local illustrator John Ryan for a tenner. Didn't get to the art gallery. The 711 Stagecoach double-decker bus from outside the station cost me £4.50 for an 'Adult Explorer' - I could have toured the whole of Kent and Sussex with it! My original plan was to go to New Romney and get a return to Dungeness, have a look at the nuclear power station and Derek Jarman's garden, then head back to Rye, so I turned down the offer of a combined bus and RH & DR ticket for £13.50. But as the schlep from the bus stop outside the Ship to New Romney station was so long and boring, I decided to go on to Hythe and catch the bus back from there - and bash (almost) the whole line. The bus route goes through Camber Sands (home to Pontin's holiday camp and 'All Tomorrow's Parties') and Lydd, where those huge front-opening transporter planes used to carry cars over the Channel. There are also lots of caravan parks, Martello towers and enigmatic clusters of what look like military buildings surrounded by high fences, but very little in the way of sea views - there is a huge concrete wall in the way. With its huge stretches of open water, Romney Marsh is a haven for bird life, if I only knew what they were! I arrived at New Romney and bought a RomneyRover for £10.50 (I should have got that special bus ticket!) and wandered round the station. There were a couple of gorgeous locos in steam (including No 3 Southern Maid) and a couple of others just hanging around (including No 4 The Bug). I popped into the Heywood Buffet to claim my free mince pie and visit to the model railway upstairs, then went out on Platform 1 to get the 14.08 last train to Dungerness. But blow me, it was being pulled by a diesel (No 12 John Southland), one of only two on the RH & DR! I grumpily got in, consoling myself that I'd come to see the steamers, not be pulled by them. But at Romney Sands station, on the opposite platform was a train headed by No 2 Northern Chief (amazingly built in 1926! ), so I jumped ship and headed back to New Romney! I never got to Dungeness and their noted fish and chips. 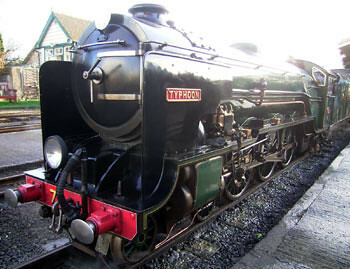 Back at my starting point I was treated to a change of engines and No 7 Typhoon took over to Dymchurch and Hythe. The journey itself was nothing to write home about - saw lots of back gardens and bunnies in the fields - but it was such a joy to see the whisps of smoke, hear the whistles and catch a whiff of sulphur as we went through tunnels. Caught a glimpse of No 5 Hercules coming the other way. At Hythe, took a few snaps then headed to the bus stop, just round the corner. The scenery from the top deck of the bus was a lot more interesting than from the train back through the desolate marshes and strange villages as the sun was setting. In Rye, I popped into The (smokey) Pipes for a half of IPA (80p!!) and then to the station for the hourly train to Lewes then home. Spent NYE, as tradition dictates, with Simeon, Avy and others in the Heart and Hand. A grand day out, must do it again in the summer. More photos on Flickr.